I had a comment from one of my English readers that there was not much to read unless the Swedish language skills were brushed up. I thought that since those skills were more or less non existant to start with I would write in English today. There may be a bit of Swinglish going on when it comes to dog training but what the hell.. Yesterday was a good day for clearing up gardens. We had loads of stuff in our back garden so we borrowed our neighbours horse trailer and drove to the tip to get rid of it all. I am very pround to say that I even managed to reverse the horse trailer without hitting anything. We have lovely neighbours and very handy ones to have around when you are missing any tools that you may need when living in a house. So to say thank you for lending us the horse trailer, giving us a sofa and a bedside table, and lending us a mega high grass cutting thing (this is what happens when you don't know the English word - röjsåg in Swedish) we invited them in for a nice cup of coffee and home made strawberry/apple/raspberry pie (home grown raspberries and strawberries I am proud to say). 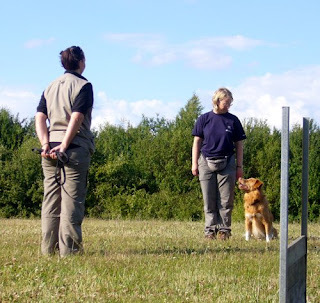 After all that I went down to meet Malin and Maria (new person to me) to do some dog training. It is very good training with other people. 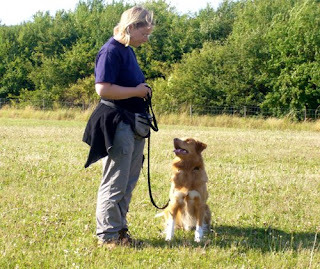 It is good to practice with other dogs since that is what the case would be at a competition and the other handy thing is to have another set of eyes to see what things we are doing wrong and especially from people that have lots more experience than I have. To be honest training did not go as well as I would have liked it to go. 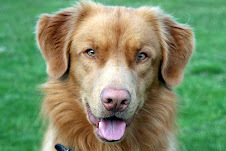 We practised positions ( Guinness sitting beside me (heel). It is all about details. He has to learn to sit straight beside me and not jump at me before sitting down). They had loud music playing in the village (music festival going on) and that destracted him. Nevermind. The retreiving part of the training was better. In the competition he decided to lay down with the wooden retriever thing (apportbock in Swedish) so we have practised lots on sitting down and staying sitting all along. So it is getting better. Just want to say thanks to Malin for the patience with me and my not so focused self. That was all yesterday....Today has been a very nice day. Started with a 5 km run in the woods with Guinness. I used to think it was too much hard work to run in the morning without breakfast and everything but now it seems that I am at my best in the morning. I like running in the woods because I do not need to worry about traffic and other people so much (considering tha Guinness is with me) and there is plenty of shade. Since I am doing the picture thing here ( I am very new at all this) I thought I would end todays up-date with a couple of pictures from the wedding we went to in England a couple of weeks ago. We had a lovely time at the wedding and in the few days we were in England we managed to vistit a few friends and I got to show Niclas where I used to live (Gerrards Cross, Gloucester, Cheltenham and Lutterworth). och på engelska dessutom (+flera bilder) Du är ju en fena på det här med bloggandet redan. Dåligt gick det absolut inte på träningen igår Malin! O vilken skillnad med apporten! Bara att höra av dig om du vill hänga med o träna nästa vecka.